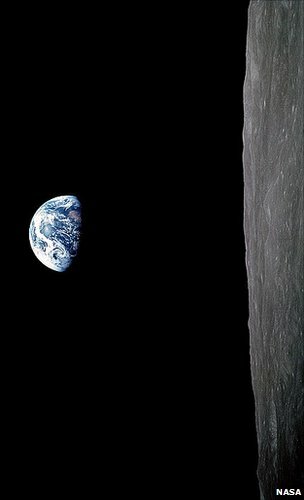 Earth rise as seen by the astronauts on Apollo 8. History may not immediately spring to mind as a hobby but in fact it is a very popular one. History buffs typically have a particular period of interest, such as the American Civil War or Wild West period, and obsessively learn everything about it. Space history buffs are no exception. They spend innumerable hours reading about space history events such as the Space Race, and pride themselves on knowing not only the important facts but also the trivia that makes the period come alive. They try to visit as many of the relevant historical sites as possible. Collecting memoribilia of the time is often a symptom as well. There are certainly many periods and topics for the space history buff to explore. The history of modern rocketry and space exploration intertwines closely with many of the most dramatic political and technological developments of the 20th century. See the other topics page for suggestions on space history subjects to explore. Space exploration has had great impact on many individuals, especially during the space race beginning in the late 1950's. We include here a list of Personal Space Histories for those who have a web page dedicated to their own space experiences. Space Age Archaeology - examines "the cultural heritage of space exploration"
Vintage Space - Amy Shira Teitel. This magazine, published semiannually and free of charge to subscribers, often has space history related articles. NASA Marshall Spaceflight Center in Huntsville, Alabama has played a major role in the history of spaceflight. Led during the 1960's by Werner Von Braun, MSFC was responsible for the development of the Saturn rockets. This site is a rich source of not only the history of MSFC but of NASA and spaceflight history in general. NASA's NSSDC (National Space Science Data Center) provides this "list of a known (successful and unsuccessful) lunar and planetary missions including a few historical missions which were instrumental in the development and evolution of space exploration." See also the individual lunar timeline and Mars timeline. Huge amount of historical information on every aspect of space activity that occurred there since the start of rocket launches at the Cape in 1950. Also, it provides a nice overview of the History of Rocketry. This site presents digitized transcripts of the audio transmissions for famous space missions in an easy to read, Twitter-like post format. Mark Wade created this enormous site that spans space history and current events. Exhaustive entries cover just about every rocket and spacecraft ever built. Lots of info on US, European, Russian, and Chinese space efforts. Calvin Hamilton's spectacular PlanetSpaces multimedia site includes a large section on space history. Study the history of "rocketry, early astronauts, space missions, spacecraft through a vast archive of photographs, scientific facts, text, graphics and videos." Jacques Edwin van Oene's page gives systematic compiliations of many aspects of spaceflight such as lists of all the astronauts from, 1959 to 1992, including the MOL military astronauts,cosmonauts from 1960 to 1994, international astronauts, Atlas rocket launches since 1990, and so forth. Jonathon McDowell provides, besides his famous Space Report, a number of historical resources. These include a archive of launch vehicle photos that reaches back to the 1950's. Organized chronologically and by type. Other historical pages include a list of non-human astronauts, Orlan spacesuit history and Chronologies. The home site of the USA's foremost aerospace museum. Main sections are Research and Collections (includes archives and Space History Division) , Exhibits, and Public Events, News & Info. The Ultimate Space Place provides both lots of info on space history and also sells space collectibles and memoribilia. Paolo Ulivi built this site that gives a broad history of the unmanned lunar and planetary programs. Covers programs in US, Soviet, European, and other. Spaceflight Directory - Sandcastle V.I. "a summary page for each manned spaceflight project, of both the United States and Russia, and linked pages that include details of each and every individual mission. But before going to the directory, you might want to check out the comparison drawings below. Each thumbnail is linked to a 640x480 JPEG file (about 60kb each). Each individual spacecraft was scanned from published line art and then scaled, cleaned up, and colorized with Photofinish." Located in Cape Canaveral, Florida, the museum "preserves both the hardware and the spirit of United States' ventures into space. The museum displays numerous missiles, rockets and related space equipment". YouTube Channel - offers a set of space history videos. This well designed site covers the development of space technology from from early rocketry to the shuttle program. Includes not only the US and Russia but discusses space efforts of many other countries as well. Here are sites dedicated to the massive N1 rocket that would have propelled cosmonauts to the moon if it had been successful. N1 project - the Association of Experimental Rocketry of the Pacific built a detailed 22 ft model rocket of the Soviet N1 moon rocket, including 42 first stage motors. The successful 3 stage launch on July 21, 2001 reached 1650 ft. Site includes lots of historica info on the N1. Asif A. Siddiqi has built this site dedicated to the Soviet space program. Sections include Soviet/CIS ballistic missiles, spacecraft, etc. Sputnik remembered: The first race to space (part 1) by Asif A. Siddiqi - The Space Review - Oct.2017 - Part 2 - Excellent account of how Sputnik 1 came about with lots of new information. Sputnik: The New York Times on AOL - A special New York Times site dedicated to the Sputnik launch and the reprocussions it had on the US. "This special presentation of The New York Times on America Online includes articles and photos from the first week following Sputnik's launch, coverage of the U.S. response and the early days of the space race, and a directory of related websites." CNN Cold War - Sputnik - This episode of CNN's mammoth series about the cold war is dedicated to Sputnik and the impact it had on the cold war. Sections include a special multi-media rich timeline page on the space race and a Time magazine article of the time. Also, see the page on Cold War technology. The First Space Race: Launching the World's First Satellite - Jim McDade interviews Matt Bille, the co-author of this book, at collectSPACE - news - "Book Preview: The First Space Race"
Future of Space - 50th Anniversary of Sputnik - Popular Mechanics - includes several sections including this Private Space Race Handicap , which reviews the outlook for several entrepreneurial space companies. There is also this interesting display of most all of the space launches since 1957: Time Line - Every Launch Ever. Sputnik's blastoff: the terrifying view from the launch site - Jim Oberg on the drama of the Sputnik launch. The Exploration of, and Conquest of, the Moon! - Ken Murphy reviews two classic books that tried to forecast the course of space exploration. In 2011 there were celebrations of the 50th anniversary of the first human flight to space. There were many articles and commentaries leading up to the 50th anniversary of the event. The movie has been quite popular: New 'Yuri's' Film 'First Orbit' Seen By 2.6 Million People - Moonandback - Apr.20.11. Mark Wade's Encyclopedia Astronautica presents an extensive history of the Soviet space program with lots of images, details on rockets and spacecraft, biographies, etc. Soviet and Russian space history is here presented by Robert Christy. 'Zarya' means 'dawn' in Russian and was used as Yuri Gagarin's call sign and is the name of the first element of the International Space Stations. Sven Grahn is a top program manager at the Swedish Space Corporation but he is also well known as a historian of amateur space radio, especially for picking up transmissions from Soviet/Russian spacecraft. Karl D. Dodenhoff's Little Space Museum (see below) offers lots of images and detailed technical information on the Soviet program such as the History of the Soviet Manned Lunar Program sections. The Ariane program evolved into the commercial company Arianespace in 1980. This page gives highpoints in the history of the company. Jonathan McDowell's History of Spaceflight includes this section on European Space. (Also Les fusées en Europe) Gives a history of European space launchers, suborbital rockets, and rocket ranges. See also the list European acronyms. Started in the 1950's with small sounding rockets, the Japanese space program has developed into one of the largest and most ambitious in the world. They set long term goals and methodically moved towards them in incremental steps. Today Japan has developed a world class launch vehicle, the HA-II. A vigorous space science program has launched scientific payloads to the moon and Mars. A reusable vehicle, HOPE, is under development and there is a strong hypersonics research program. There are some eccentricities in the Japanese space program that grew out of post-war society and politics. Rocket launches, for example, are restricted to short periods of the year due to objections from a small, but politically powerful, fishing lobby that claims that the noise bothers the fish and that falling boosters might hit their boats. JAXA (Japan Aerospace Exploration Agency) is the national space agency of Japan. It was created in 2003 from the combination of NASDA (National Space Development Agency of Japan), which had previously carried out national space projects, ISAS (Institute of Space and Aeronautical Science), which grew out of university research, and the National Aerospace Laboratory (NAL). There is now also a companion Flight Journal in development. The first installment is the transcript of the flight of Apollo 15..
Lunar orbiters have started imaging the six Apollo landing sites with higher and higher resolution. Here are galleries and resources sites for these interesting observations. NASA's site that commemorates the 30th anniversary of the first moon landing. As July 20, 2009 approaches, there are a number of efforts to commemorate the 40th anniversary of the first Moon landing. Below are some of the websites offering special programs and resources in recognition of that accomplishment. will recreate Apollo 11’s lunar mission, minute by minute, with an interactive experience that lets visitors experience the mission as it happened, using archival audio, video, photos and “real time” transmissions. Information at the Lunar & Planetary Institute on the background to the decision to begin the Apollo program. The NASA History section hosts Bruce K. Byers story of the Lunar Orbitor program which put unmanned probes around the moon. Their findings provided much useful data for the later manned landings. Information at the Lunar & Planetary Institute on exploration of the Moon. Includes the Apollo Missions and also the unmanned Ranger and Surveyor programs. It also covers the Russian Zond and Luna missions. Links section includes lots of model sites. See the online version of the National Air & Space Museum exhibit on the space race. National Air & Space Museum, in addition, has this web site dedicated to the Apollo program. Apollo 11-The entire air-to-ground communications - Live365 broadcast provided by Mike Smithwick. Over 40 hours of audio. Explore the Apollo 11 Landing Site - An interactive tool at NASA that lets you look around the Apollo 11 site. He did say "One small step for a man, one giant leap for mankind"
You'll Never Moonwalk Alone - Strange Maps - Mar.24.08 - An interesting post at Strange Maps showing a map of the range of activities of Armstrong and Aldrin. TimeLife "A GIANT LEAP FOR MANKIND"
Though objectively a failed mission, Apollo 13 has become a shining example of NASA at its best. Saving the lives of astronauts took tremendous technical skills, great teamwork, and innovation under terrific pressure. Here are various sites and articles about the ill-fated mission. Arguably the most important and most risky of all the Apollo missions. Going directly to the Moon with an "all up" test of the Saturn V was a stunning achievement. The mission's success set the Apollo program on course for the Apollo 11 landing the following summer. "Host Bob Edwards talks to Andrew Chaikin about the flight of the Apollo 8 Astronauts and the famous picture of the earth and moon taken from space thirty today years ago. (6:47)"
John Duncan's website is devoted to the Apollo program and the Saturn rocket. David S. F. Portree built this enormous site of information about the developments leading to the exploration of Moon and Mars to eventual expeditions and settlements. See also the companion site Contact Light, which gives personal retrospective on Kipp's growing up in the Moon race days. Huge resource site on all aspects of the race to the moon including extensive info on the Soviet program. A NYT Magazine article about the Soviet Union's ill-fated attempt to beat the US to the moon. The PBS show Nova has this site to support its show about the race to the Moon. - Includes Hear the Space Pioneers. Apollo Lunar Landing Guidance & Control - Ron Noteborn provides lots of details about the Lunar Module and how it managed to land on the moon. A 3D lunar module simulator applet is included. Lunar Module, SpaceCraft Assembly & Test- This site (also called LM S/CAT Remembered) from Frank A Pullo is dedicated to the Lunar Module and its construction and testing by Grumman group in Bethpage, N.Y. The Project Apollo Image Gallery - beautiful digitizations of rare Apollo project images. Time/Life's "A Giant Leap for Mankind"
Cape Canaveral at Astronautix- very informative map showing launch pad vs mission. Also, a chronology of major events at the Cape. Apollo: Race to the Moon (Amazon) - book by Charles Murray & Catherine Bly Cox on the history of the Apollo project. Apollo Image Atlas - Lunar and Planetary Institute - "The Apollo Image Atlas is a comprehensive collection of Apollo-Saturn mission photography. Included are almost 25,000 lunar images, both from orbit and from the moon's surface, as well as photographs of the earth, astronauts and mission hardware." Apollo Image Archive - Arizona State University - scans of large format (44 inch) photos taken during the Apollo missions. Apollo 11 First man on the moon - 360 Panorama - panoramas.dk - includes panoramas from the other Apollo missions as well. T-Minus: The Race to the Moon - this graphic novel tells the Moon Race story from the viewpoint of the engineers building the rockets. A Tribute to Honeysuckle Creek Tracking Station - about the radio telescopes used to receive data and audio/TV signals during the Apollo missions.